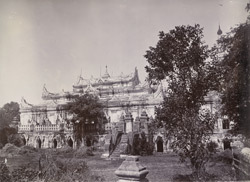 Okkyaung: showing the main building, [Maha Aungmye Bonzan, Ava]. bl.uk > Online Gallery Home	> Online exhibitions	> Asia, Pacific and Africa Collections	> Okkyaung: showing the main building, [Maha Aungmye Bonzan, Ava]. Photograph of the main building of the Maha Aungmye Bonzan monastery at Ava (Inwa) in Burma (Myanmar), from the Archaeological Survey of India Collections: Burma Circle, 1907-13. The photograph was taken by an unknown photographer of the Burma Archaeological Survey. Ava is a ruined royal city situated at the confluence of the Irrawaddy (Ayeyarwady) and Myitnge rivers a short distance south of Mandalay. It was founded in the 14th century as the capital of a Shan kingdom, later becoming the capital of the Burmese empire from the early 17th century until replaced by Amarapura in 1783, then again briefly between 1823 and 1841. The brick and stucco Maha Aungmye Bonzan monastery (also known as the Ok Kyaung) was built by the chief queen of King Bagyidaw (ruled 1819-38). It was damaged in the earthquake of 1838 but was repaired by the queen of King Mindon Min. At one end of the main building rises the elegant tiered roof or pyat-that of the shrine room of the monastery, the hpaya-saung.